Best University Easel - For painters and pastel artists. This easel offers a wide range of tilt adjustments including a forward tilt of nearly 60 degrees to allow pastel dust to fall from the surface or to reduce glare. Many professional artists work in both oils and pastels. This easel was designed for them. Working in a large studio light becomes a major problem. With it comes reflection. Because this easel is designed to tilt forward or backward it gives the painter far more flexibility in getting their light at just the right angle. When switching from oils to pastels, the problem of falling pastel dust can drive one crazy. With this easel you can tilt it forward so that the dust falls free to the floor and not down the face of the painting. We do recommend layering paper on the floor to catch the falling dust. 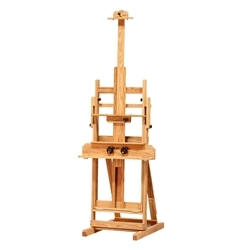 This easel was designed to shift the weight to the rear when the easel is leaning forward. This gives the easel the necessary stability required for this position. The University Easel can hold canvasses up to 84 inches high. Base width 22-1/2 inches and depth 30 inches. Ceiling height at lowest setting is 75 inches and 110 inches at highest setting. Deluxe 30 inch wide painting tray features tool shelf and two stainless steel cups. Includes a middle tray for smaller works. Piano hinges at joints for maximum strength. Double laminated base for extra strength. Front locking casters are optional. Shipping weight is 68 lbs. Ships partially assembled by truck. Each BEST Easel is made of American oak, sanded to a smooth surface, then hand-rubbed with oil to reveal the inherent beauty of the wood grain. The craftsmen at BEST nail, glue, and wood screw every joint, guaranteeing strength and precision. Only the highest quality hardware is used as these easels are constructed to last a lifetime. The shipping cost of $99.95 applies to most areas of the 48 contiguous states. Some very remote locations which may involve a secondary carrier may require an additional fee. If this is the case to ship to your location, we will notify you prior to shipping for authorization. Hawaii and Alaska as well as international destinations require a separate quote. Ships partially assembled.